Manjuyod Sandbar is an almost unexplored paradise, and this is definitely not easily beaten by mass tourism. A real surprise that welcomes the tourist who is for the first time in the Province of Negros, in the Visayas region. You'll find only few bungalows emerging during the low tide and a white sand bar 7 kilometers long, where you can walk surrounded by a sea of indescribable color. Getting to Manjuyod Sandbar is not simple, because this place is out of the most well-known tourist destinations, and offers few services. But it's definitely worthy, if you are looking for something different from usual destinations offere by travel agencies! It's necessary to plan the trip in advance, and to check the tide calendar in order to enjoy all the beauty offered by the island in its wild nature. Manjuyod Sandbar is located near Bais and Dumaguete, in the province of Negros Oriental, and we suggest you to visit these places too. The fastest way to arrive is with one of the daily flights from Manila to Dumaguete with the local airlines Cebu Pacific or Philippine Airlines. The flight is about 3 hours and a half long, and costs about 70 USD. Once in Dumaguete, you can take a bus (Ceres lines) and in about one hour and a half you'll get to Bais. 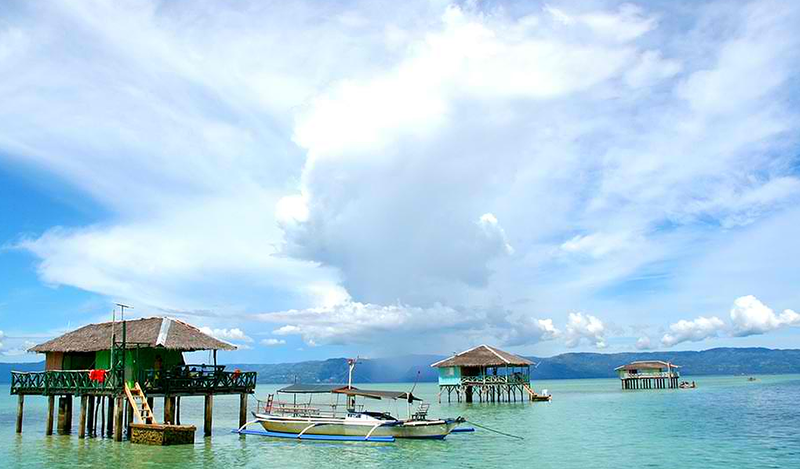 From Bais you'll reach the Manjuyod Sandbar with a 20 minutes trip by boat. It's a short journey, but there might be mishaps, so we suggest to organize yourself in advance. The only way to do that is to book in advance the boat, the only means of transport available to reach Manjuyod Sandbar. The size of the boat will vary according to the number of persons booking the trip. We suggest to rent a boat in Bais for the entire day, and sail early in the morning, so you will have time to enjoy the sea, dive and swim with the dolphins, and reach one of the cottages at the sunset, during the low tide.